By the time they reached the Division I-A state championship tournament, the Wolverines were pretty well tapped out of overachievements. 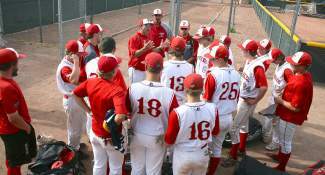 The defending state champs lost consecutive games, 15-1 to Faith Lutheran and 11-5 to Elko, for a quick exit from the state tournament in Henderson this past Thursday. Truckee, which entered as the No. 2 seed from the North after scrapping out of the loser’s bracket of the regional tournament the previous week, posted a final record of 17-19 overall. “I’m more than happy. I can’t believe we even got there (state),” said Truckee coach Mike Ellis. “We had six returners basically, but only four of them really started last year, and they couldn’t carry the whole team. And we were lacking pitching pretty much. We struggled the whole season to get there. Truckee immediately ran into stiff competition in its 9 a.m. opener Thursday. Faith Lutheran (28-9-1), which went on to sweep through the tournament en route to winning the state championship, was a powerhouse, with well above average hitting and pitching, Ellis said. Faith Lutheran was one of the nine Division I schools to drop down to the Division I-A for 2012-13. The Wolverines fell into a quick hole against the Crusaders, who scored three runs in the first inning, including a two-run home run by Caleb Summerhays, before chasing Truckee starter Erik Holmer from the game with a 10-run third. Johnson, meanwhile, was dealing. He held Truckee hitless through three innings as his team built a 13-0 lead. The Wolverines finally broke through with a mini rally in the fourth, as Pado led off the inning with a walk and advanced to second on a passed ball, and Andy McKechnie singled to put runners on first and third while breaking up the no-hitter. With no outs, Pado scored on a double play off the bat of Erik Holmer. Jackson Rohlf then flied out to end the inning. The Crusaders answered with two more runs in the bottom of the fourth, and the game ended on the 10-run mercy rule after Truckee failed to score in the fifth. Johnson finished with eight strikeouts while allowing only one hit and one walk. The loss sent the Wolverines to the loser’s bracket, where they met top Northern seed Elko (29-5), which opened with a 16-5 loss to Boulder City. Elko had defeated Truckee four times during the regular season and playoffs, and the Indians continued the trend in the Thursday afternoon game. Truckee took the early lead with a run in the first inning and another in the third. Elko bounced back with a four-run bottom of the third, however, then added seven runs in the sixth to build a commanding 11-2 lead. Truckee rallied for three runs in the top of the seventh, but it wasn’t enough. The game started off with promise, as Rohlf drove in Holmer with a two-out single in the top of the first inning to put the Wolverines on the board. Pado then scored Truckee’s second run in the third inning after walking and later coming in on an error. Elko took advantage of two Truckee errors in the bottom of the third to take over the lead, 4-2. Truckee starter Riley Guiragossian recovered and pitched into the sixth before running into more trouble, again aided by a couple of Truckee miscues. The Wolverines didn’t go down without a fight. They scored three more runs in the top of the seventh, as Pado drove in two with a triple, and McKechnie drove in the third run with a double. Holmer followed with a double but was left stranded to end the game. Elko went on to lose again to Boulder City, 6-1. Faith Lutheran then defeated Boulder City 14-3 for the championship. Ellis said he’s optimistic about Truckee’s future. He was impressed with all four JV call-ups for the postseason — Mike Jones, Connor Nicholas, Eli Yale and Cameron Holabaugh — while the Wolverines return six other players from this year’s team. “I’m looking forward to next season, but I’m real proud of these guys for getting to state,” said Ellis, adding that the Wolverines have now played into the state tournament the past six consecutive years.